Many families are struggling to figure out how to best manage screentime in their own home. The following is a re-post (lack of capitalization included!) from Happy Stuff, which is run by the inspiring Carissa Christner, long-time LittleeLit contributor and soon-to-be trainer. 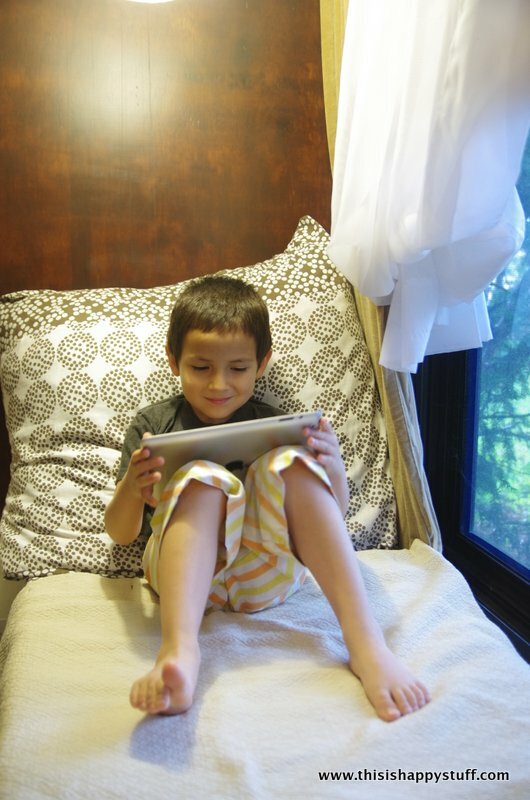 thanks for sharing balancing “screen time” Carissa! i’ve been thinking a lot about the healthiest ways to incorporate apps and technology into our family life. many parents deal with the issue by setting a daily time limit, and while that seems so nice and tidy and easily quantifiable (there’s even an app for that! ), i know that if i were playing an interesting game and i was just about to complete a challenge and someone told me i had to turn the game off right at that moment …. i’d whine and complain and possibly even throw a giant fit too. i would also feel like i had a right to use up every minute of my maximum allowed screen time every day, as though if i didn’t use it all up, i’d be getting cheated out of my rightful screen time. if the happy family tried that option, i’d spend large portions of my day having conversations about “just 5 more minutes” or “but i’ve only had 25 minutes of screen time!” or “that screen time didn’t count because i didn’t like that game” or “what if i called granna on facetime, would that count?”* and other “referee” questions in which i’d be constantly re-interpreting and re-creating arbitrary rules. that makes me cranky. plus, those questions are not teaching my child the bigger life lesson of how to include technology in a balanced diet of daily activities. my friend carisa kluver created this wonderful model for teaching kids how to balance their own media diet (follow this link! read the article! ), but i found that it was too abstract for me to explain to my 4 year old, so i broke down the first component — balance — into a system that he could understand and for now, i’ll judge the quality and engagement components myself. Want to learn the details of Carissa’s “balance system”? Read the rest of this post at Happy Stuff! Posted on September 30, 2014, in Uncategorized and tagged Carissa Christner. Bookmark the permalink. Leave a comment.